The Song of Achilles is a familiar story (at least I think we all more or less know the general gist of the story of Achilles), but the genius is in the different perspective. 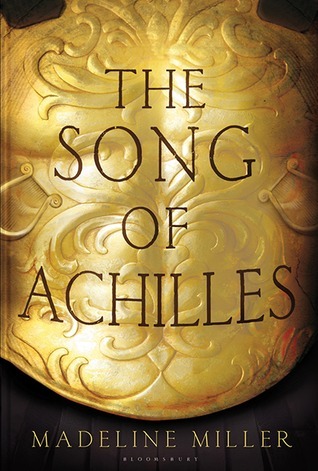 Told from the POV of Patroclus, Achilles’ best-friend-turned-lover, the familiar story gets so much richer. Even though you may know what’ll happen, you will still fall deeply in love with these characters. You will still go through an emotional rollercoaster. And you’ll wish desperately that the story could have ended differently. As I said, the story follows Patroclus, who is exiled when he is just a young boy and ends up at the court of Achilles. They grow up together and quickly become inseparable, which is why Patroclus is such a perfect choice to tell the story of Achilles. Not only does he have a front row ticket to everything, he also humanizes the mighty Achilles so very much. We get to see the character, who could easily only come across as the stereotypical arrogant and proud hero, as an actual human being. Because while Patroclus is definitely deeply in love with Achilles, he still manages to see his flaws along with his perfections. However, despite Achilles’ perfections, it is Patroclus that I personally fell in love with while reading their story. He is just the definition of a cinnamon roll. He is not destined to be a hero, but he still somehow manages to help, fight and inspire in his own way. His heart is his biggest strength and I really enjoyed seeing his character develop throughout the story and finding out about the effect he had on others, but most especially on Achilles himself. The story is a beautiful character-driven story, with two very intriguing main characters but, while they each shine separately, it is when they are together that the story really stands out. The romance in this book is just one of the most gorgeous, moving and inspirational love stories I’ve ever read. Yes, this story still contains a lot of action and war and bloodshed – it takes place for a big part during the Trojan war after all – but it is first and foremost a story about these two characters and their love for eachother. Their love takes center stage throughout the entire story and it is guaranteed to bring out all your emotions. You will laugh, you will cry, you will swoon. They will put you through the emotional ringer, but it will be so worth it. Overall, I can only say that I adored this story and that it is one of those stories that I would recommend to literally everybody. Read this if you love Greek mythology. Read this if you’d like a new and different perspective on the Trojan war and beloved characters such as Achilles, Odysseus, Chiron, Hector and more. Read this if you love wonderfully developed characters. Read this if you love a gorgeous (but also heartbreakingly tragic) LGBTQIA+ romance. Read this if you want a new take on a timeless story, something original, violent, romantic and heart-breaking all at once. Have you read The Song of Achilles? What did you think about it? Omg this looks so good! Great review Lindsey! And damn you read fast??? will my heart be shattered after reading this? I really have had a lot of books like that WHICH WRECK YOUR SOUL? IT IS REALLY GOOD 🙂 <3 But yes, I'm afraid that it will shatter your heart and possibly wreck you soul... Probably a good idea to have a fluffy feel-good book ready to read after reading this one! I love Greek Mythology, I also loved Achilles. This sounds like a very interesting and heartbreaking take on the story, even though Achilles was already a tragedy . Glad you enjoyed the writing! I am reading this next week! And I am SO excited for it. I’ve heard nothing but good things about this book. It was picked for our book club. Great review! I’m thrilled you love it Now I’m even more excited! Greek mythology has always intrigued me. I like the idea of shifting to a new perspective for a familiar story. Great review! Ahhh I love this book so much! The ending made me cry A LOT. Yes, it’s definitely a book to read with tissues nearby to help with the massive amount of tears! I am SO glad you loved this too. It’s one of my absolute favorite books. It’s been 2 years since I read it, I think so your review kind of makes me want to re-read it now. Yes, it’s definitely an amazing book and for sure one of my all-time favorites as well <3 And that quote is beautiful as well! The entire book is filled with so many beautiful quotes. i read this last year and loved it so much! it was beautifully written and so unexpected and AHHA everyone needs to be made to read this book! it also taught me so much about greek mythology! Uma @ Books.Bags.Burgers. recently posted…Fantastically Diverse – Wrap Up and a Question! Ohh amazing review I’ve been dying to read this book so bad, but I am waiting until I am emotionally ready to check it out. Because I know this book is going to emotionally break my heart and I am not ready yet to read it yet. But hopefully I can read it soon. Thank you so much for the awesome post. Thank you ! And yes, it’s definitely one of those books you’d have to emotionally prepare for… Hope you’ll enjoy it when you get to it though! I definitely thought it was an incredible read so I’m happy it caught your attention 🙂 Hope you’ll enjoy it!